Update on building a house. Well here is a dumper truck and a pile of earth making a ramp down onto our land. That happened last time we were in Ponte de Lima, which was in the middle of June. Now it is the middle of July, nothing has changed and we have returned to the UK. We cannot afford to stay while nothing is happening and sadly nothing is. So what can I say to you? Before we embarked on this enterprise, we were told how much people admired us for taking the risk of building our own house, the implication being that we were being foolhardy. We, however, hoped that since we spoke Portuguese we would be able to iron out any problems. Hubris? Perhaps. What certainly seems to be the case is that they were right: we were wrong. There has been so much delay that not long ago I asked the architect how many days there were in a Portuguese week, commenting that in the UK we had seven in ours. Things scheduled to take 2-3 weeks have taken more like 6 or 7. I worked out that if the projected timetable were true, then each Portuguese week must have between 23 and 24 days in it! • The architectural plans were promised for the end of July or August but there was a delay as the architect completed projects with other, in his view, more pressing deadlines. In fact they weren't ready till Christmas. 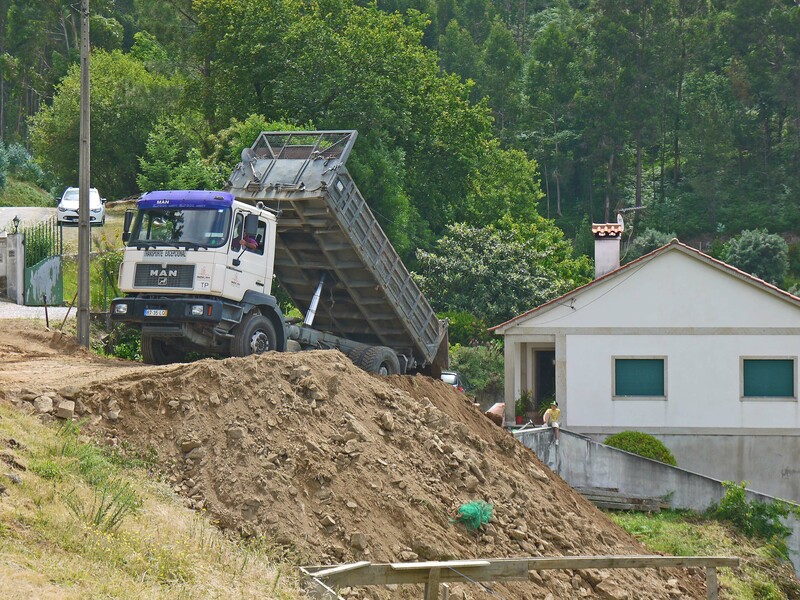 • When the plans were submitted to the 'camara' - the local council - it was discovered that the projected placement of the building overlapped a tranche of land that had been appropriated when the local council built a wall to support the hillside road. We were under the impression that we had bought that land but it materialised that it wasn't the owners' to sell. Our solicitor said we could pursue compensation but that it would probably have to be through the courts. Well would you? It is, of course, a good thing that the road is being protected but why did no one know about the expropriation of the land? Why didn't our solicitor find out? Sadly searches are not performed by solicitors in the same way as in the UK. You pay your solicitor for checking that the person selling the property actually owns it, that building is allowed on the land and for writing legal documents. He or she doesn't, for example, write to the local council asking if they have any projects in the area which might impact on the house, nor do they write to the water, gas and electricity companies to ascertain the legal situation regarding utility provision and any problems involved. No checks are made about projected major works whether roads, railways or new supermarkets, for example. Nobody checks on mining rights and other esoteric possibilities. When we sold a flat in the UK, the solicitor had a file 4-5 centimetres thick with copies of enquiries sent out and the subsequent replies received. The cost for a great deal more work than was done in Portugal was much the same. Fortunately, however, we were told that if we moved the position of the house and submitted new plans it would be reassessed but that cost us weeks and weeks of delay. • Then it turned out that the parish council had decided to name our once unnamed road. There was another month's day and a couple of hundred euros to pay getting the title deeds changed. • Finally the architectural design was approved and the engineering plans were submitted. This, we were assured was a formality and would take only a couple of weeks. Unfortunately one official was away on holiday for some time and had not, it seems, delegated his work. When he returned and had examined the plans, they were passed to other officials for checking and signing off. Where in the in-trays were those plans? Who knows? A statutory duty to provide a decision within a certain number of working days would improve the system enormously. Alas there is no such rule. All we could do was wait and regret. • At last the engineering plans were approved and the builder even got his license in only three weeks BUT we need a high tension electricity connection for the crane. This must be provided by EDP, the owner of the network. This has meant months more delay. It appears that the Chinese have bought a large interest in EDP and that reforms are being put in place – or that is the excuse we have been given. Whatever the case we have now been waiting at least eight weeks and there is no sign of permission being given. There are rumours though that instead of allowing any qualified electrician to make the installation, it will now have to be a registered company and that there may be a fee of several thousand, instead of several hundred, euros. Are they just rumours? Who knows? No one is answering emails or calls. As our architect says, "You are dealing with the machine." Our experience of the 'Warm Front" heating scheme for old people in the UK is that insisting on a limited number of licensed providers is a recipe for shoddy work and increased prices due to lack of competition. This is a worry. We are now considering hiring a generator for the crane so we can get the project under way without waiting for the electrical connection. I have loved Portugal for a long time but if I were to give anyone thinking of building in Portugal any advice, it would be, "Don't!" I would suggest that they either find an already existing house - and there have been a lot of bargains in the Algarve and other holiday village projects around the country – or that they rent a house for long periods. They could save themselves a lot of heartache, expense and regret. At the moment I am sorry we ever began! I'm so sorry to hear that your plans have been so badly thwarted at every turn. I can only imagine how frustrating and upsetting it must be for you and I really hope it all comes together sooner rather than later. At some point, you will end up with your dream home but the apparent lack of systems, communication and organisation is without doubt a major headache. I've been told that the only way of keeping architects/contractors etc. on track is to persistently badger them. That's what's happened with your architect - someone else has been pestering harder and got bumped up the list of who he feels he needs to deal with first. Rather than trust that people will do as you've agreed, they need constant contact, which is more work for you but might help to speed things up a little. Good luck! Thanks Julie. It's delicate balance isn't it? I want to get on but I don't want to antagonise people. If they start saying, "Who is this foreigner who thinks she can come in and throw her weight about? Well, we'll show her who's boss," we'll be even worse off. I'm crossing all my fingers and toes that something will happen soon. Thanks for your good wishes.